Hi Friends! Here is the recipe of spicy, tangy and flavorful tomato chutney Tomato chutney you will enjoy with idli, dosas. Peel, wash and chop the onions , keep aside. Chop washed tomatoes and keep them aside. Take a pan heat the oil add the urad dal and when it starts to change colour, add asafetida , red chili. Fry for few more minutes till the urad dal becomes golden. Add the onions and sauté till golden, add the tomatoes ,and salt. Cover and cook till the tomatoes become soft, and are cooked. Cool the onion tomato mixture, add the seedless tamarind and grind in the grinder. Add water if required for grinding. Take out the chutney in a serving bowl. Heat a pan with a tea spoon of oil, put mustard seeds. When mustard starts crackling add few curry leaves. Switch off the heat and spread the tempering on the tomato chutney. 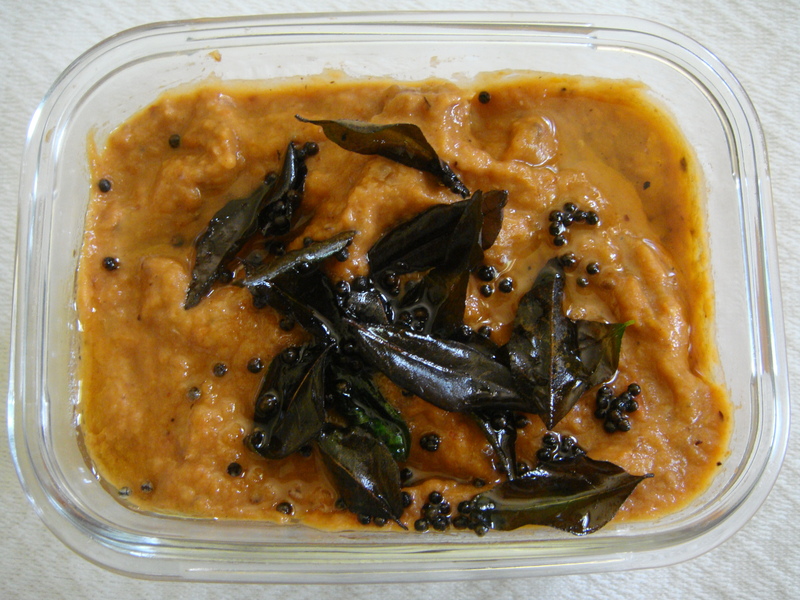 This chutney goes very well with idli, dosas or vadas. Cooked tomato products can be many different things, including stewed tomatoes, tomato paste, tomato sauce and ketchup. Tomatoes fall into the category of red and orange vegetables, and the Dietary Guidelines for Americans 2010 recommends people eat more of them. While there are plenty of nutritious components in tomatoes, recent research has focused on specific phytochemicals such as lycopene, which occurs at higher levels in cooked tomatoes than in any other food. Tomatoes are a low-calorie food, with only 33 calories in a large tomato. Tomatoes are high in vitamins C, A and K. They also contain high levels of potassium and manganese. Tomatoes are also a good source of fiber, which helps keep the digestive tract healthy by increasing stool bulk and preventing constipation. While cooking often reduces the levels of vitamins in tomatoes, some of these beneficial components remain intact. The tomato skins contain fiber and nutrients as well, so cooked tomato products with the skin are better than those without it. One of the most beneficial components in the tomato isn’t a vitamin or mineral, but the phytochemical lycopene. This compound, which gives tomatoes their distinctive red color, acts as an antioxidant in the body. Consuming high levels of lycopene can lower the risk of heart disease and certain types of cancer. Cooking tomatoes for two minutes, a quarter-hour and a half-hour boosts the lycopene levels in tomatoes by 6, 17 and 35 percent, respectively, according to research published in the “Journal of Agriculture and Food Chemistry” in May 2002. A Meta-Analysis published in the April 2011 issue of “Maturitas” found that cooked tomato products could lower cholesterol at levels comparable to prescribed statins. Doses of 25 mg of lycopene a day lowered cholesterol levels by about 10 percent, according to the research. Getting this much lycopene from fresh tomatoes can be difficult, but it is easy to get this amount from tomato sauce or other cooked tomato products.